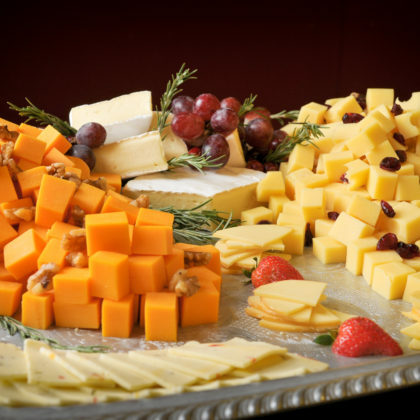 A great way to feed your guests without filling them up before the big dinner. 100 person minimum for all displays. 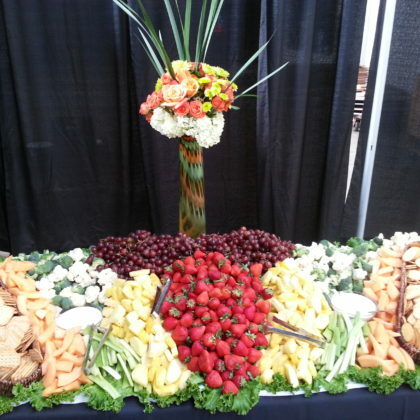 A Beautiful Display of Fresh Fruits, Cubed Cheeses and Fresh Vegetables with Crackers and Dips. This display also includes a Floral Arrangement. Display of Fruits, Veggies, Cubed Cheeses, Crackers, Dips, Italian Baguettes, Preserves, Assorted Olives. This display also includes a Floral Arrangement. 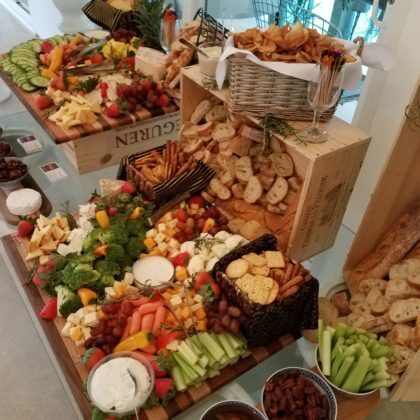 Fruits, Cubed Cheeses, Blocks of Cheese, Fresh Veggies, Crackers, Dips, Italian Baguettes, Preserves, Assorted Olives, Assorted Salamis and Prosciutto, Candied Nuts, Tapenades, Homemade Potato Chips with Dip.